I snagged this shot from our latest breast cancer support group newsletter. Here I'm showing off my ("I got my eyebrows back!") 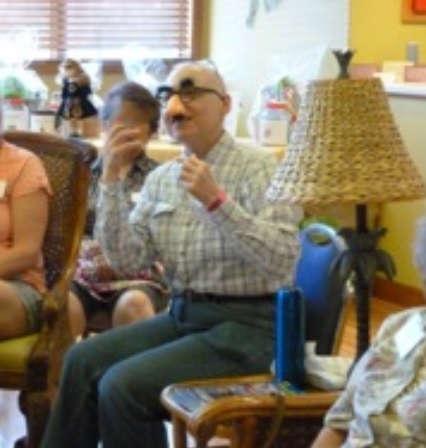 Groucho glasses at our September meeting. 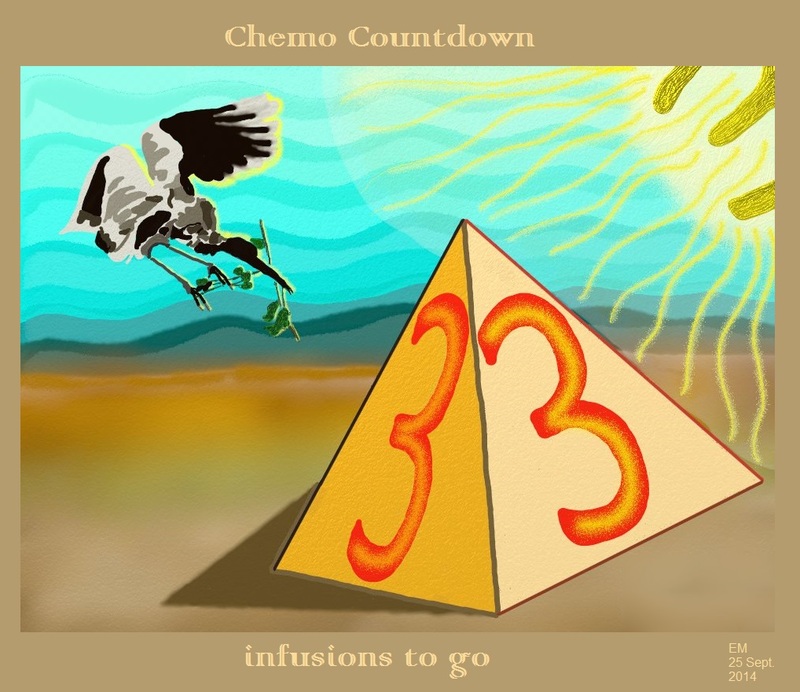 At Thursday's infusion I received the terrific news that my BRCA testing showed no mutations. I had spent three weeks on tenterhooks, looking at a scary possible decision tree (detailed in my entry "Ruminations"). Of course, other potential mutations could surface (in the PALB2 gene, for example). The deeper one looks and the more technologies that become available, the greater the number of potential decision points and comparative risks. The question then becomes: What justifies a test? In the case of BRCA, particularly the BRCA2 gene (which relates more closely to my type of tumor), I felt a test was justified. The other good news is that some of my blood work numbers have improved, including my white blood cell count (which is still low, but not as low as before) and absolute neutrophil count. It means that my immunity is better, though still compromised. I've been given clearance to get a flu shot. M has already gotten hers, but I'm going to get mine during my cancer center's business hours, just in case I experience any kind of reaction and need to go there. The flu shot uses a dead virus rather than a live one, so there shouldn't be a problem, but you never know. My calorie burn during Thursday night's workout was 9.5% higher than my next-highest chemo-day burn. (I did not work out on my Adriamycin/Cytoxan days, but I've worked out on most of my Taxol days.) I thought that was interesting, given my two weeks of increased fatigue. I had attributed the fatigue to chemo's cumulative effects -- my blood work puts me in the anemic range, after all. But now I attribute my more intense workout and greater energy in large part to the psychological boost and huge relief I experienced on hearing my BRCA test results. Those three weeks of waiting and wondering had been draining my energy behind the scenes. Maybe my iron infusions are kicking in as well. I've been told it takes several weeks for that to happen. I'm next due for an iron panel on October 9. For those looking for an antidote to pink, I recommend The Scar Project. One of its participants, Barbie Ritzco (a.k.a. "Marathon Barbie" and "The Warrior Queen") died this past week. "4. She first felt her lump when she was training and about to deploy to Afghanistan as a gunnery sergeant. She did not want to let down her fellow marines, and she went anyway. Her story is included in a book The Pink Moon Lovelies: Empowering Stories of Survival. "5. She ran the Marine Corps marathon during radiation, on the heels of eight rounds of chemo and a bilateral mastectomy..."
Ritzco was the recipient of the USAA's Athletic Inspiration Award and spoke of her experiences in this video. THREE SMILEY FACES FOR YOU !!!!!! Smilies back at'cha! Keep on keepin' on. So happy for you on the good news about your BRCA results! Still waiting for mine, hopefully this next week. I'll continue to be here cheering you on as you continue to count down, you are such an inspiration. Am cheering you on as well! I'm keeping my fingers crossed for good news on your BRCA results. I'm very glad that you're BRCA-. Hang in there, light at the end of the tunnel is in sight. I'm keeping my fingers crossed your blood test and checkup go well!